Prepared by Adrian Wayne, National Chairman Spearfishing, AUF. My partner Jackie & I chose to spend ten or twelve days driving up from mid north coast NSW through outback NSW, QLD, NT & finally back down in WA to Exmouth. How hot it was is hard to comprehend with 40 plus degrees C every day after Mt Isa until just before Exmouth. Trip went well & we were pleased on arrival a couple of days early to book into the event centre, Potshot Hotel & Resort. All of the event ceremonies, weigh-ins, briefings etc were held at this central point which made things easier to run. 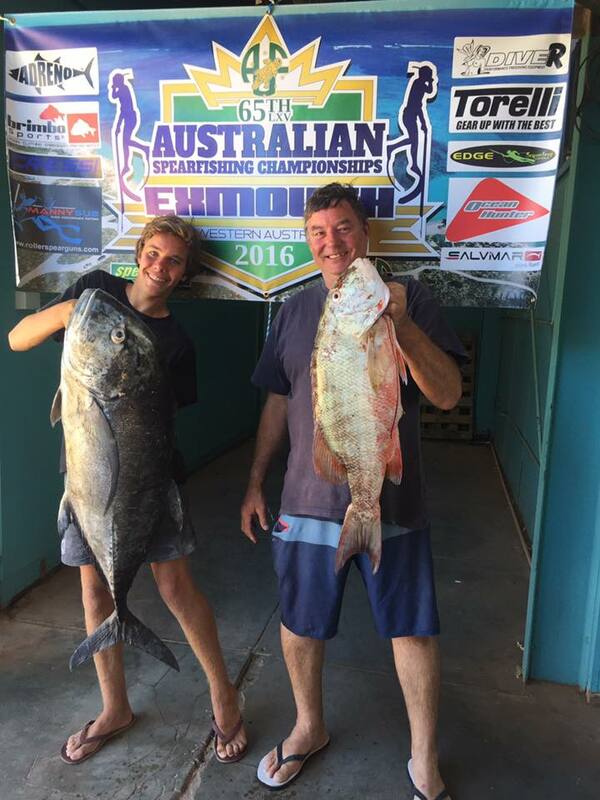 Some competitors were already here and although conditions were pretty ordinary inshore due to moon & wind the offshore conditions were good & some very nice fish were taken using locally from hired boats. 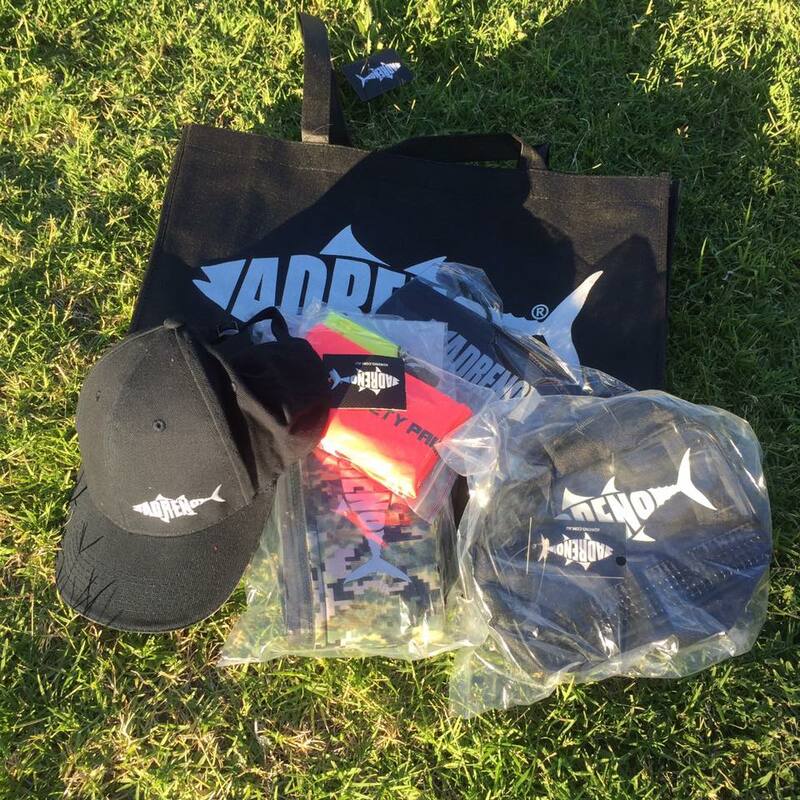 Adreno donated a bag of goodies to each entrant including hat, gun cover, safety pack, and mask bag. The event was scheduled to be held from five locations all within a 30 minute drive of the Potshot. Sign on & registration Sunday evening & as conditions were moderating it was decided to give Lighthouse Bay a go for heat one of the open. Turned out not as well as expected with viso less than 8 meters & as bad as 2m in some areas. All competitors put in the full 6 hours & considering the conditions some decent fish were taken. This day saw Jarod Eriksson leading slightly from Dwayne Herbert of NZ. The rest of the field were a long way behind. The usual first day anomalies were encountered with fish not weighing, missed identification, fish not on scoresheet etc. That evening it was decided to give the film fishing & fin swimming a go at a wind protected sanctuary, Turquoise Bay for day 2. Everyone had an enjoyable day completing the film & fin race events & just spent the rest of the day snorkelling & relaxing at the beach. Fin swimming involves a swim of 100m from point A to point B with no use of hands. Film fishing requires divers to find species off the scoresheet and take photos, and the images are judged and scored. 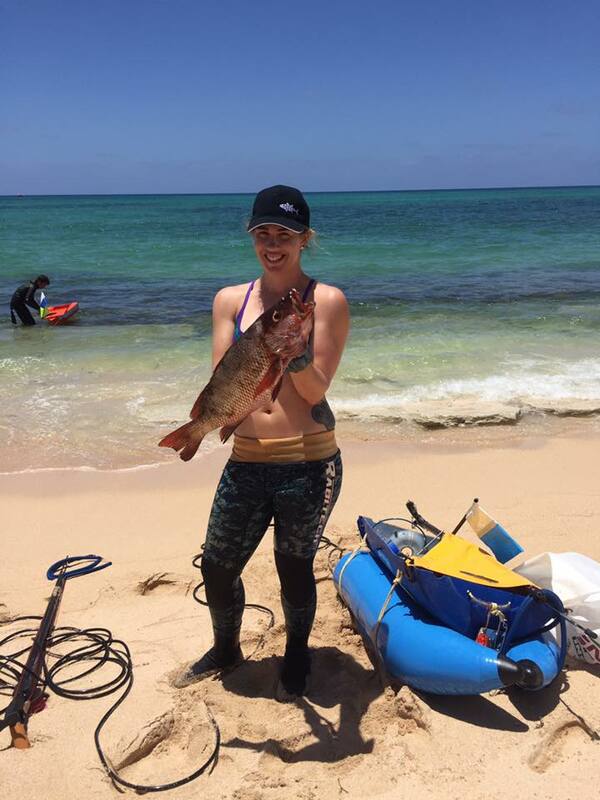 Each of these categories contributes to an overall award called the "Superdiver Award" which is highest points between the spearfishing competition, fin swimming and film fishing as a whole. Driving back to Potshot it was noticed that conditions were improving more & more. Decided that evening to have another rest day on day 3 as conditions looked great for days 4,5,6 which would complete the event although we would be diving 3 hard days in a row without a rest day and also diving the same day as the presentation. 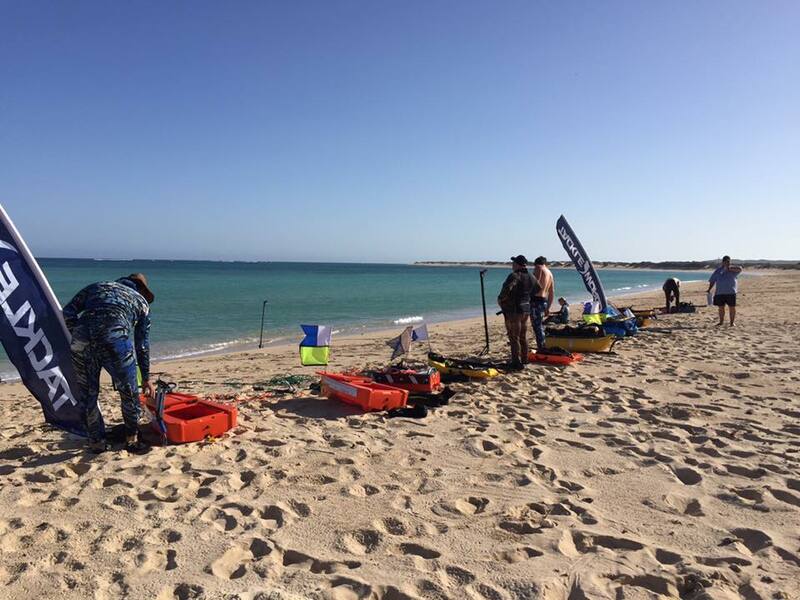 A rest day but some competitors hired boats to go offshore & others looked over the zones in much improved conditions. Again some great fish were seen & taken. This evening it was decided to give Woribi a go. 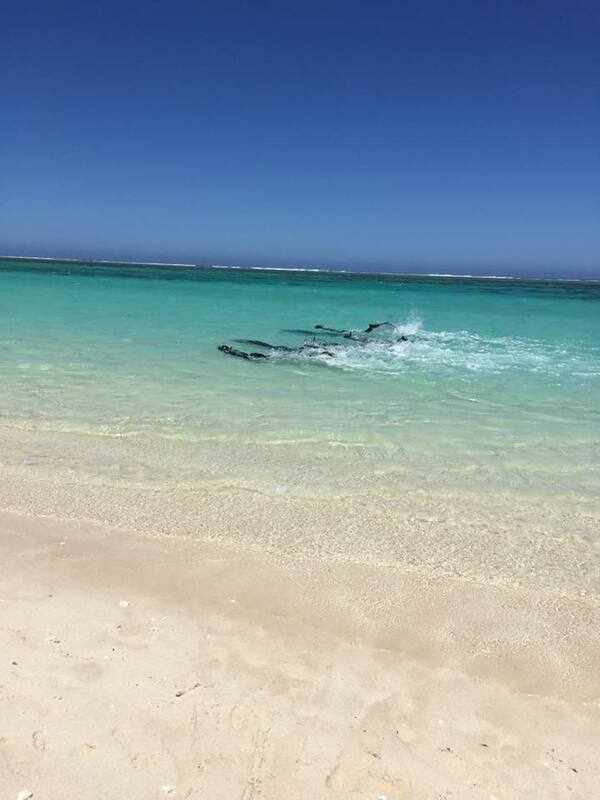 We were greeted by very favourable conditions with fish & sharks in abundance. A good spread of pelagic's were taken. 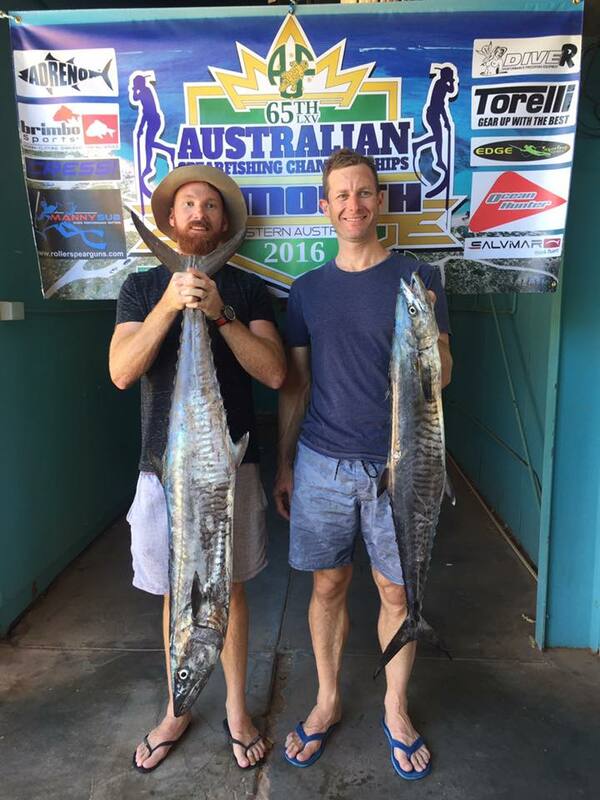 Good sized Barracuda, mackerel, GT, dart, & reef species were taken by most competitors & this day saw Dwayne push well into the lead with 13 species & 60 odd kgs of allowable weight. The weigh in went really well with all hands pitching in to assist. It was decided to give Mauritius a go for Final Heat 3. Again we were greeted by favourable conditions & all but one competitor, Jarod Eriksson headed in the same direction. The day was full of big lost fish stories & once again the ever present harassment by dangerous sharks. Dwayne pulled ahead again & although the QLD & WA contingent were catching up the day one & two lead was unassailable. The Ladies & particularly the Junior & Sub Junior had all improved from the first day & everyone had great moments to share. Another successful weigh in & it was decided to run the true pairs the next day at Bauden. 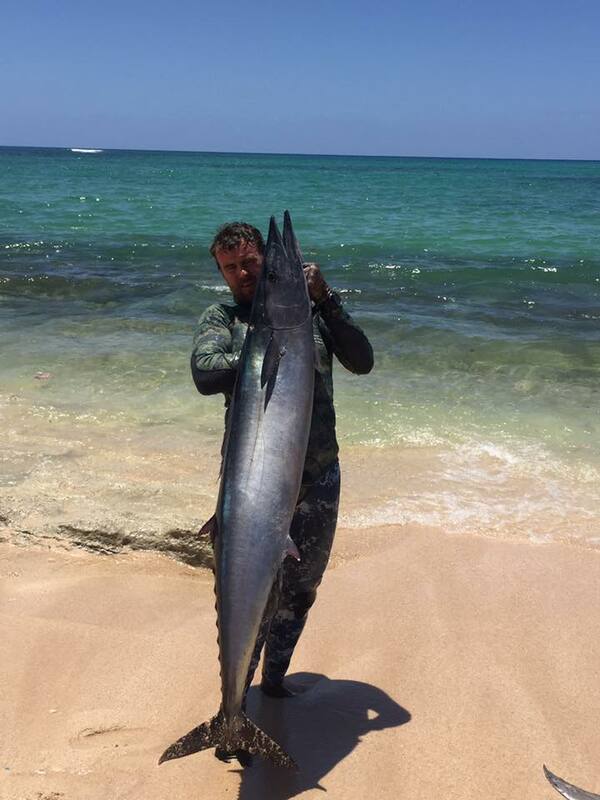 Kiwi Dwayne Herbert's 26kg Wahoo from a shore dive! Graham and Dwayne with epic shore diving species. Exmouth sure produces the goods! Only three pairs were interested which is understandable given how hard & hot the diving had been up to this point. Conditions had deteriorated a bit with patchy conditions for visibility. 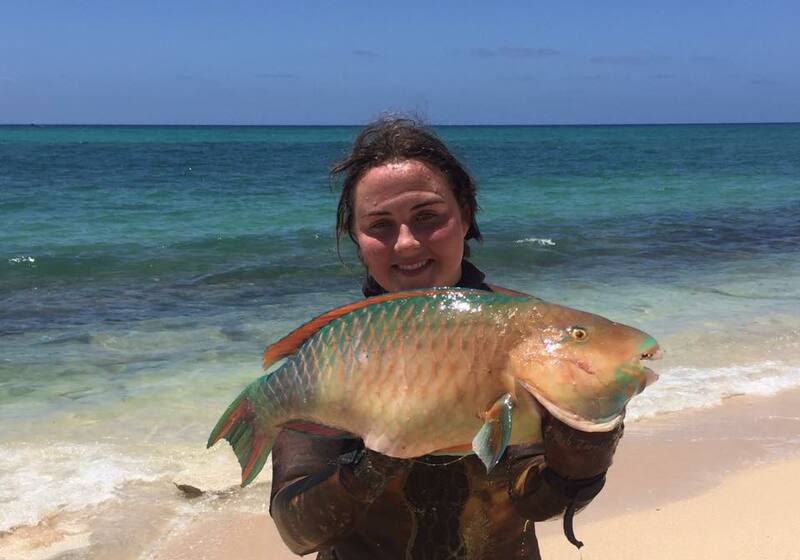 It was decided to take all Parrot Fish off for the day & although some good fish were taken it did not come up to the expectations from the previous day's. The results are shown in the results sheets. It's noteworthy to say that Female Nikki Watt from QLD went out for a social blue water spear with a local & she shot & lost a 140 kg blue marlin. I'll let her tell that story herself. A number of pending record fish were also taken. The presentation was held this evening & all went well with the catering, the venue & a great list of prizes from a handful of very supportive suppliers, I can't thank them enough for helping support these events & their organisations. Finally I must thank Graham Carlisle for his exceptional almost single handed organisation & running of the event. Also my deepest thanks to my partner Jackie who won't finish working on the paperwork for some days yet. Thanks to Annette McKenzie for her tireless assistance & to all you competitors for your help & patience. 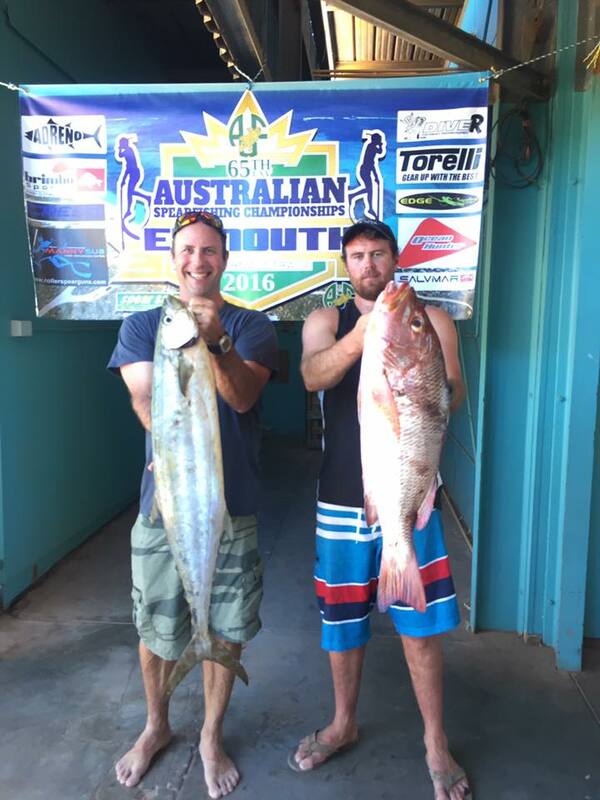 Next Australian Spearfishing Championships will be in Southern NSW TBA.